As you know we love doing things a bit different up here at Team Moon Gazer, and we love working in collaboration with other Norfolk producers. So, it was a perfect match made when good friends Pat and Sarah – of Black Shuck Gin – just down the road in Fakenham asked to share the Passion. 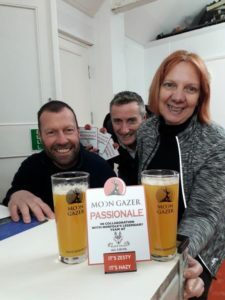 Having successfully launched their own Passion fruit gin last year the guys knew that the fruit offered a fabulous intense flavour and wondered how it would also pair with beer. So, as it was all about the Passion, we figured what better time to launch it than for Valentine’s Day. Just taking a very quick step back, I do need to elaborate a bit about how this collaboration came about as in fairness to Sarah she very kindly bid for the opportunity to brew to raise funds for our chosen charity It’s On The Ball – a gesture which is so very much appreciated by us and the charity. First off for those that enjoy passion fruit you will know that this South American fruit is so called as it is one of the many species of passion flower. The fruit is strongly aromatic, sweet, exotic but with a delicious – and it’s fair to say dominant – tart flavour. This tartness is reminiscent to many of the great sour beers we now enjoy, but has a subtle difference in maintaining a certain sweetness too – most likely down to the sweet aroma. Don’t forget up to 85% of our taste actually comes from what we smell. So, keeping that aroma in the beer was very important to us. To achieve that we used rather a lot of passion fruit. Just imagine how many of the tiny berry fruits it would tale to make 20 kg of passion fruit puree without the seeds and skin. Answer A LOT! Also, we wanted to balance out the hops – nothing too bitter as we wanted a sweet and sour taste, not bitter and sour. We used a couple of British hops – Admiral and UK Cascade – to add orange, grapefruit and lychee notes, but we were very light on the hops. Adding the passion fruit directly to the fermenter would allow maximum flavour to develop. Now, in fairness there was a heart stopping moment trying to get the very viscous fruit blended sufficiently with the beer but nothing that a pump and a few strategically placed hoses couldn’t sort out. It was also useful having Pat and Sarah around as they would be asking questions and making suggestions based on their own experiences, so throughout the brew little tweaks and changes were made to how we normally do things. As for the result – well we love it! Now it is different to what you normally get from Moon Gazer. For starters it will carry a haze – the shear amount of fruit which we used will see to that and we want that flavour staying in the beer. Secondly its tart. Yup the first sip may pucker your lips – but in a nice way – but the next sip leads to a crisp, dry and tart fruit zinginess while the aroma of Passion fruit wafts up ya nostrils. To be honest it’s probably a drink to be savoured by the half not necessarily in pints. And definitely a drink which will pair well with robust foods such as spice, cheeses, smoked meats and the like. It’s a special beer as it was brewed with friends but we love it for other reasons to. So, if you are out for Valentine’s Day this year pop along to your local pub and share in the Passion. Don’t forget also to tuck in to a Black Shuck Passion gin and tonic as well as all participating pubs will be having one of those dropped off too.